Utes know that if they win their last four regular-season contests, they’ll go to the Pac-12 title game. 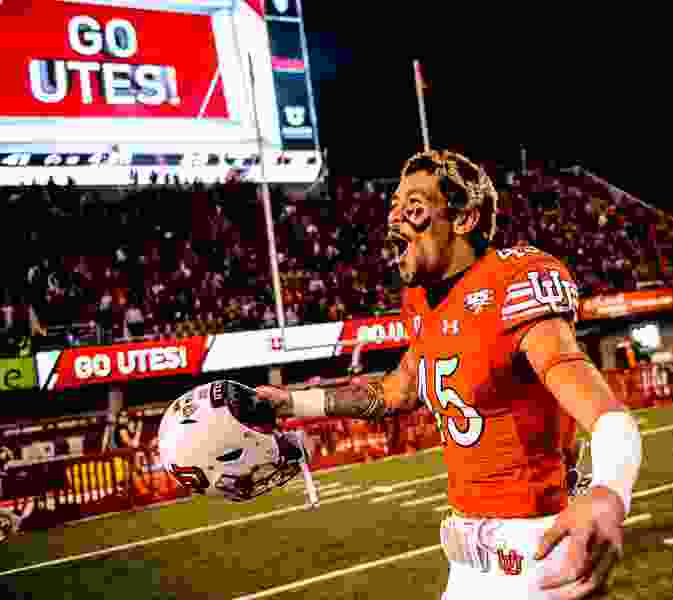 (Trent Nelson | The Salt Lake Tribune) Utah Utes wide receiver Samson Nacua (45) celebrates as the Utah Utes host the USC Trojans, NCAA football at Rice-Eccles Stadium in Salt Lake City, Saturday Oct. 20, 2018. Cody Barton’s words hardly seem silly now. After the Utah offense struggled through a 21-7 loss to Washington in a Pac-12 opener, the senior linebacker targeted a rematch in the conference championship game. “I’m confident that we’ll meet them again,” Barton said. It could happen. Or maybe the opponent will be Washington State, another current Top 25 team that the Utes believed they should have beaten in September. What’s clear is a 41-28 victory over USC created all kinds of possibilities for the Utes, with this guarantee: Wins in their four remaining Pac-12 contests will send them to the title contest Nov. 30 at Santa Clara, Calif.
UTES RANKED: Utah moved into the AP Top 25 at No. 23 and into the Coaches Poll at No. 24, earning the program’s first rankings in either poll since last October’s loss to USC. The Utes have been in the Top 25 at some point in each of the past five seasons. The resurgent Utes (5-2, 3-2) overwhelmed USC in the middle portion of Saturday's game and tied the Trojans for first place in the Pac-12 South. Owning the tiebreaker, the Utes just have to match USC's closing performance. Other variables are in play, including Arizona State's facing each co-leader in the next two weeks. Regardless, the Utes have earned their position with a 3-0 month, a year after going 0-4 in October. Not with the Rose Bowl as a nice consolation prize for the conference champion. • Utah’s coordinators did outstanding work. The Utes were controlling the game by halftime after rallying to take a 20-14 lead, and they just got better. USC’s coaching staff had no answers in the third quarter as the Utes posted 180 yards to the Trojans' 22 and moved ahead 34-14. Troy Taylor's offense finished with 541 yards, and the diversity surely impressed dual-threat quarterback Jayden Daniels, making an official visit to Utah. Defensively, Morgan Scalley’s use of conservative two-deep zone coverage surprised the Trojans, who love to throw deep, and his group held USC to 121 yards through three quarters. • Zack Moss remained persistent. In a long stretch of the first half, Moss netted 12 yards on 11 carries. But he kept coming, gaining 107 yards on his last 13 runs and finishing with 136. Moss has 753 yards this season and should be eager to face a UCLA defense that allowed 289 rushing yards to Arizona. • The Utes should take a good look at the Rose Bowl on Friday. A return to the iconic stadium on New Year’s Day is in play. ESPN’s Football Power Index favors Utah in every remaining regular-season game. Quarterback Tyler Huntley. This has been quite a month for Huntley, who last season was injured against Arizona and missed Utah's losses to Stanford and USC. He's beaten all three teams decisively in October, completing 53 of 69 passes (.768) for 741 yards and seven touchdowns, with one interception. Huntley accounted for 374 total yards and five touchdowns with his passing and running vs. USC. He was sacked five times and lost a fumble that resulted in a USC touchdown, but he often dodged the rush and threw the ball accurately to an improved group of receivers and tight ends. Runner-up: Chase Hansen. The senior linebacker made three tackles for loss on running plays and was excellent in underneath coverage, making his second interception of the season. Toby Gerhart breaks down the Utes and their exponential play over the past few weeks. Covey's 46-yard catch and run for his first touchdown of the year. The score followed his 38-yard kickoff return, with Utah trailing 14-0. He bounced off a defender after the reception and broke another tackle on his way to the end zone, giving his team hope after a disastrous start. Runner-up: Huntley’s laser to Demari Simpkins for an 11-yard TD in the third quarter, completing a long drive to make it 34-14. Whittingham made another 12-hour celebration decree Saturday, with the Utes playing on a Friday for the second time in three weeks. UCLA (2-5, 2-2) is not out of the South race, having beaten California and Arizona after an 0-5 start under coach Chip Kelly. The Bruins preserved a 31-30 win over Arizona by using six-plus minutes on a game-ending drive.